"Human nature is neither good nor bad, it simply is. Human beings are born helpless, and thus they need other human beings to take care of them, adults who have already internalized the rules and institutions of their group and can spread them. There is not, therefore, a human essence, but there is a human condition: the first is fixed and immutable, the second is malleable and adaptable; the first is the kingdom of the domain, the second is the kingdom of the possible freedom". The totally Western idea of a perverse and wicked human nature has always dominated our social imaginary, fueling the belief that only strict social institutions, such as the State, can dominate it making coexistence possible. Furthermore this vision, beyond its hierarchical and unequal return, has placed a heavy burden on the future of humanity, claiming the existence of a human nature which is universal and whose full realization has therefore to be ensured. On the contrary, the libertarian thought, from early classics to contemporary reflections, definitely rejects the idea of an unchanging, universal, founding human nature. In front of the junction between nature and culture, naturalism and environmentalism, necessity and freedom, relativism and universalism, it consciously avoids resolving into a synthesis the tension between these opposites. Indeed, it explicitly recognizes its own legitimate uncertainty in a deliberately unstable balance. In other words, the libertarian thought, and anarchism in particular, is obliged, in order to be true to himself, to consider ontology not as an essence but as a condition and a becoming. Francesco Codello (Valdobbiadene,1953) is a pedagogue; he has worked as teacher and headmaster. 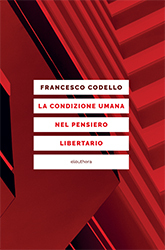 Editor of the magazine «Libertaria» and member of the Democratic Education Network, the European Democratic Education Community and of the Rete dell'Educazione Libertaria, he has written numerous essays on educational and historical topics. With elèuthera he has already published Né obbedire né comandare, lessico libertario, (Neither rule nor to be ruled), 2009.